Why Does Commitment to Development Matter? In our integrated world, decisions made by the richest countries about their own policies and behaviour have repercussions for people in lower-income nations. At the same time, greater prosperity and security in poorer countries benefit the whole world. They create new economic opportunities, increase innovation, and help reduce risks posed by public health, security, and economic crises. The Commitment to Development Index (CDI) celebrates high-income countries whose policies benefit not only themselves, but also the development of others and promote our common good. 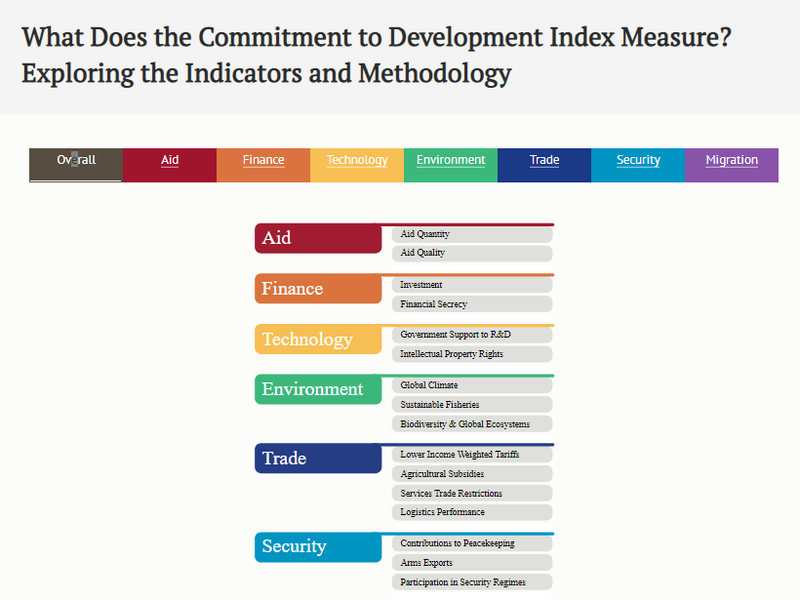 How do we calculate the Commitment to Development Index? We use thousands of data points across more than a hundred indicators to come up with overall rankings and for each policy component. Countries score well for things like generous and high-quality aid, financial transparency, low barriers to trade for developing countries, and migration policies which are open and promote integration. They also do well for policies that enhance global public goods, for example, robust support for technological research and development, protecting the environment, and contributions to global security like peacekeeping contributions and avoiding arms sales to poor and undemocratic nations. Like the Sustainable Development Goals, the CDI recognizes development progress is holistic. But while the SDGs focus on outcomes and all nations, the CDI emphasizes how the policies of the richest countries can make a huge difference. CDI 2018 Results: How Well Are Countries Doing? Sweden tops this year’s Commitment to Development Index, followed by Denmark. Germany climbs to the podium and shares third place with Finland. Sweden scores well across six out of seven components of the CDI, ranking first on migration, second on environment, and third on aid. It has room for improvement on security, given its substantial arms exports and low contributions to international peacekeeping and sea lanes protection. Denmark comes second this year, topping the list on security and with the second-best aid score. Finland and Germany share third place. Finland scores consistently well across nearly all components. Germany scores particularly well on migration and trade, with the most efficient trade logistics and the least restrictions on trade in services. However, Germany could improve its aid quality and its contributions to international security. European countries lead the way. European countries take up the first 12 positions on the Index, highlighting European leadership on development issues. France comes seventh this year, with good performance across all components. It is one of the few countries which has increased its aid spending, by 0.05 percent to 0.43 percent of gross national income (GNI). The United Kingdom, in eighth place, is the third G7 country in the top 10, scoring especially well on trade and security. The UK is one of the few countries meeting the international commitment of 0.7 percent of GNI spent on overseas development assistance but ranks in the lower end of the table on technology and migration. 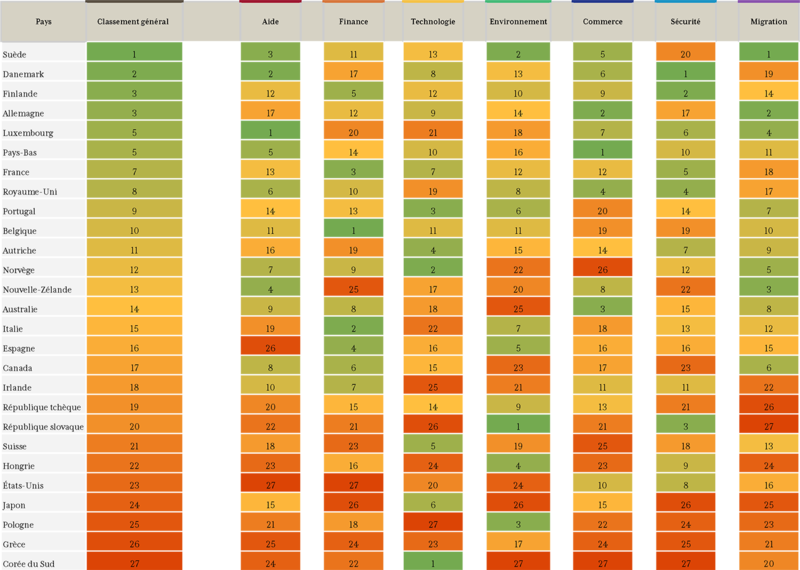 The Netherlands and Luxembourg share position five and Belgium ranks 10th. All three countries have smart policy designs in place: Luxembourg tops the aid component; the Netherlands the trade component; and Belgium the finance component. Portugal, in ninth position, demonstrates that commitment to development isn’t for the richest only. Despite its contribution to global security, the United States ranks 23rd of 27. Like last year, the United States scores close to the bottom of the table, performing poorly on finance, aid, and environment, with high greenhouse gas emissions, significant fossil fuel production, and the lowest gasoline taxes. Its best performance is on security as the biggest contributor to global sea lanes protection and a major supporter of international peacekeeping. However, its security score is held back for failing to ratify most international agreements, including the Arms Trade and Nuclear Test Ban treaties. Our trade data predate the recent protectionist trade policies implemented by the US government, resulting in the US scoring above average on trade, with low agricultural subsidies and average tariffs. The US’s stated withdrawal from the Paris agreement only comes into effect in 2020 but will lower the US score further. Poland, Greece, and South Korea are at the bottom of the CDI. Even countries ranked near the bottom provide lessons for others on supporting development. South Korea ranks last on the CDI. Its performance on trade, environment, and security are the lowest in the CDI. However, with its extraordinary support for innovation and research and development, it maintains its position at the top of the technology component. Greece comes second to last, with performances below average on most components, but it leads the way on low gasoline taxes and is rewarded for its openness to asylum seekers. Poland, in position 25, lags on technology, migration, and aid, but tops the league on biodiversity protection. Netherlands, Germany, and Australia are the leaders on trade, and most countries’ trade tariffs are lower against the poorer countries. The 2018 CDI data predate the most recent round of tariffs implemented by the US. The Netherlands, Germany, and Australia are respectively the top three on trade. The Netherlands has low tariffs, good trade logistics (such as infrastructure and customs procedures), and open trade in services. It also has lower agricultural subsidies than Germany. Australia has low tariffs, open trade in services, and low agricultural subsidies, but relatively poor trade logistics. This year, the CDI took a new approach to measuring trade tariffs, which gives a higher weight to those levied against lower-income countries. On this basis, tariff levels have been relatively stable for the past decade and CDI countries’ tariffs tend to be progressive—that is, lower against the very poorest of their trading partners and higher against the richest. The table above ranks each of the 27 CDI countries across seven policy areas. View the interactive results here. 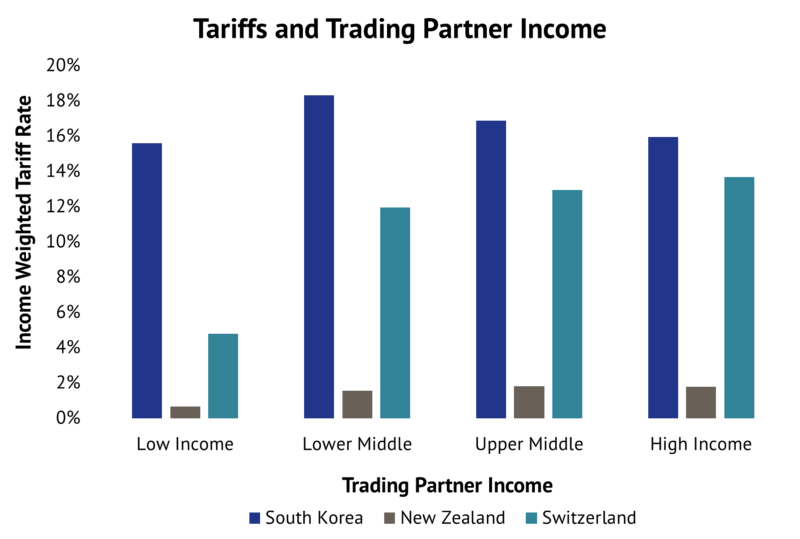 Foreign assistance remains an important source of finance for some of the poorest countries, so the CDI rewards countries that give more aid than their peers as a share of their GNI. The CDI measures the quality of aid with the revised Quality of Official Development Assistance (QuODA) assessment, which uses 24 indicators that reflect accepted aid-effectiveness principles of maximising impact, fostering institutions, reducing burden, and promoting transparency. A country’s aid quality score is the combination of its bilateral QuODA score and the QuODA scores of the multilateral agencies to which it disburses aid. 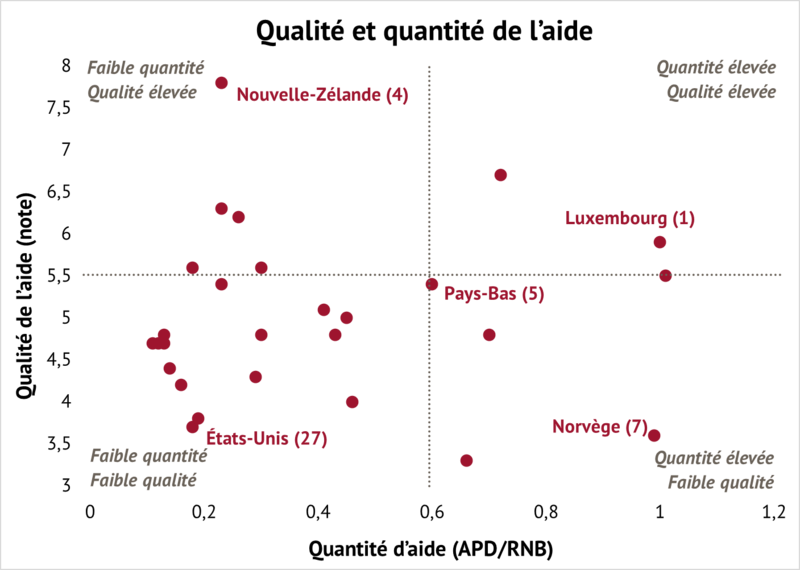 While few countries are strong on both quantity and quality of aid, Luxembourg ranks at the top of this component—providing a full 1 percent of national income and scoring well on the quality of its bilateral aid. Sweden also performs well, while Hungary provided the least (0.11 percent of its GNI). The United States has the greatest room for improvement. Despite being the largest donor in absolute terms, it provided just 0.18 percent of its GNI for aid, and although it disburses aid to effective multilateral agencies, US bilateral aid scores poorly. 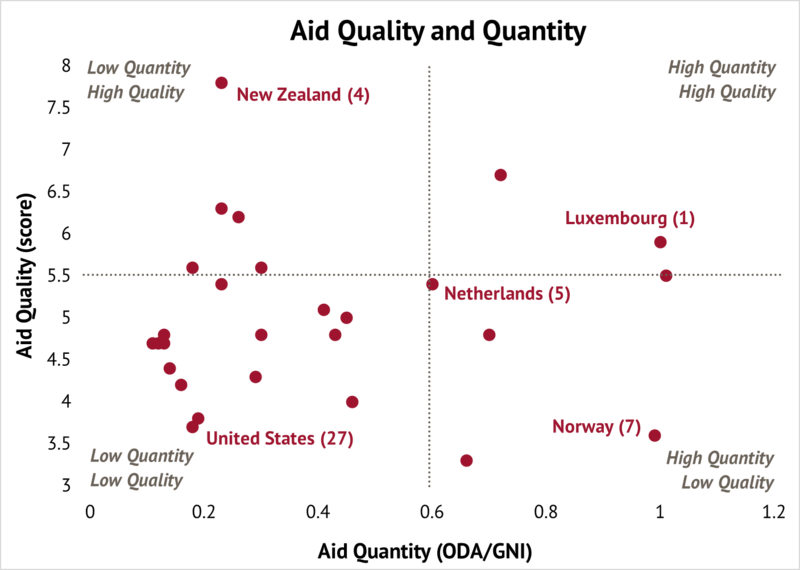 New Zealand ranks highest overall in aid quality, with extremely effective bilateral aid. South Korea, Japan, and Canada disburse aid to the most effective multilateral institutions. Numbers in parentheses indicate the country’s rank in the aid component. 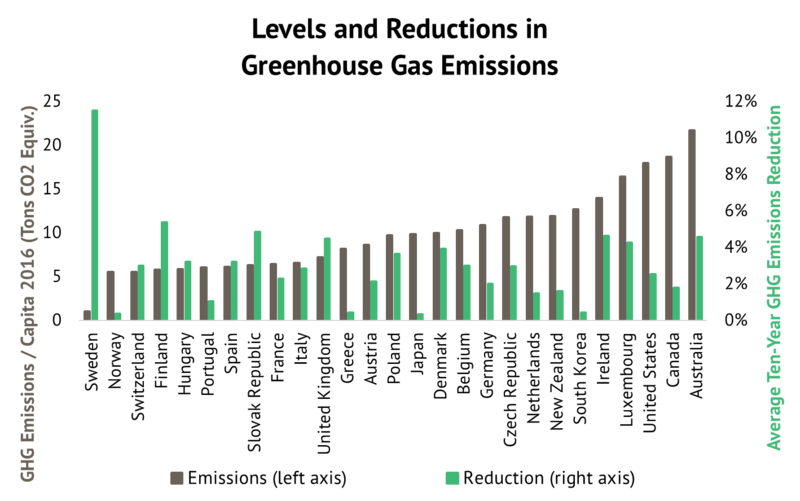 Foreign direct investment is the largest source of financing for many developing countries. The CDI rewards wealthy countries with policies that support investment and those that sign on to international commitments (including preventing bribery and safeguarding human rights) but do not undermine partner countries’ ability to develop sustainable public policy. 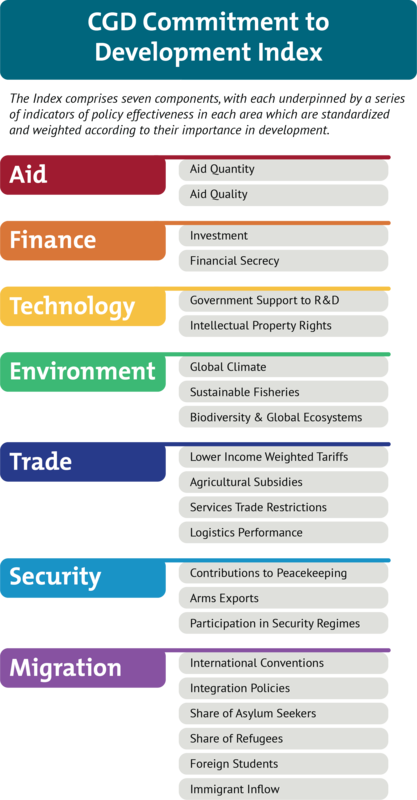 Policies that allow for financial secrecy, in contrast, enable tax evasion, money laundering, and corruption, and degrade governance and international security; these are assessed using selected indicators from the Financial Secrecy Index. Belgium ranks first on finance thanks to its international commitments on investments and transparency in the financial sector; Italy and France take the next two places. The United Kingdom ranks above average but would significantly improve its score if its overseas territories and crown dependencies moved in line with the rest of the UK. Spain is the most transparent financial jurisdiction, followed by Italy and Ireland. Medicine, sustainable energy, information and communication technology, and other technological advances improve the lives of all. Technologies invented in rich countries, such as vaccines, mobile phones, and high-yielding grains, have improved—and saved—many lives. But advanced economies can also impede the diffusion of knowledge and technology with restrictive protections for intellectual property rights. The CDI penalises countries for policies that can inhibit the international flow of innovations but rewards government support for research and development (R&D). South Korea, Norway, and Portugal are top performers on the technology component. All three countries are committed to high levels of government and incentives for business expenditure on R&D. South Korea’s policy environment supports business expenditures on R&D of over 3 percent of GDP, and the direct government support to R&D reaches 1.5 percent of GDP. Poland ranks last, spending less than 0.2 percent of GDP on government support to R&D. New Zealand’s legislation on intellectual property rights (IPR) is the most development friendly, followed by Canada. Greece performs poorly on the IPR subcomponent, with room for improvement especially on its rights-loss provisions. Rich countries are most responsible for climate change, but poorer countries will suffer most. They are more susceptible geographically, have fewer resources and less state capacity to deal with the effects, and many more of their people depend directly on the environment to meet their daily needs. The CDI rewards countries for decreasing greenhouse gas emissions, implementing high gas taxes, not subsidizing their fishing industries, cutting imports of illegally harvested timber, and committing to important international conventions. These measures benefit all countries. Slovak Republic is the CDI leader on environment policies, with gasoline taxes and greenhouse gas emissions reductions among the best. Sweden did best overall on controlling climate change, but high fishing subsidies held it back from the top position. Poland is in third place partly due to its low fishing subsidies and high gasoline taxes. South Korea takes last place with limited commitment to biodiversity, high imports of tropical timber, and high consumption of hydrochlorofluorocarbons. Japan and Australia also import significant amounts of tropical timber and are towards the bottom of the environment table. The chart below draws on two of the CDI’s indicators on greenhouse gas emissions and compares current emissions and historic reductions. Sweden has made great strides in reducing emissions, while Norway has low but largely unchanged emissions. Conversely, Ireland and Luxembourg have substantially reduced emissions, but they remain high relative to others. Trade provides poorer countries with opportunities to attract investment, create jobs, and reduce poverty. With rich countries in control of the largest markets, some goods and services from poorer countries still face trade barriers. High tariffs, subsidies that create an uneven playing field for agricultural goods, and burdensome red tape and legal restrictions make trade harder for developing countries. The CDI rewards wealthy countries most open to goods from developing countries, with low tariffs, few agricultural subsidies, and streamlined importation processes. These policies benefit consumers and taxpayers in all countries. The Netherlands scores best on trade with low agricultural subsidies, strong trade logistics, and openness to trade in services. As a member of the EU Customs Union, the Netherlands also has relatively low tariffs. Germany and Australia rank second and third respectively. Switzerland, Norway, and South Korea are at the bottom of the trade table. They have the highest tariff rates, limiting market access for developing country producers. For the 2018 CDI, we weight tariffs by trading partner income for the first time, with tariffs against the poorest country weighted at one and those against the richest countries tending to zero. The chart below draws from the data. South Korea has high tariffs which tended to be lower against richer trading partners than against middle-income ones. Swiss tariffs were very high but were the most progressive of all CDI countries—they tended to rise with trading partner income. New Zealand scored best on this indicator with tariffs which were both progressive and low in absolute terms. Security and development are closely linked. War and political violence can destroy livelihoods and public institutions, while poverty and institutional weakness make it easier for violence to erupt. It is in the interest of all countries to support peace and international security. The CDI rewards countries for contributing to peacekeeping and humanitarian interventions, basing naval fleets where they can secure sea lanes, and participating in international security regimes that promote non-proliferation, disarmament, and international rule of law. The CDI penalizes countries for some arms exports, especially to nations with undemocratic regimes, and for not publishing data on arms exports. Denmark leads on security as it is a significant contributor to internationally sanctioned peacekeeping and humanitarian interventions. 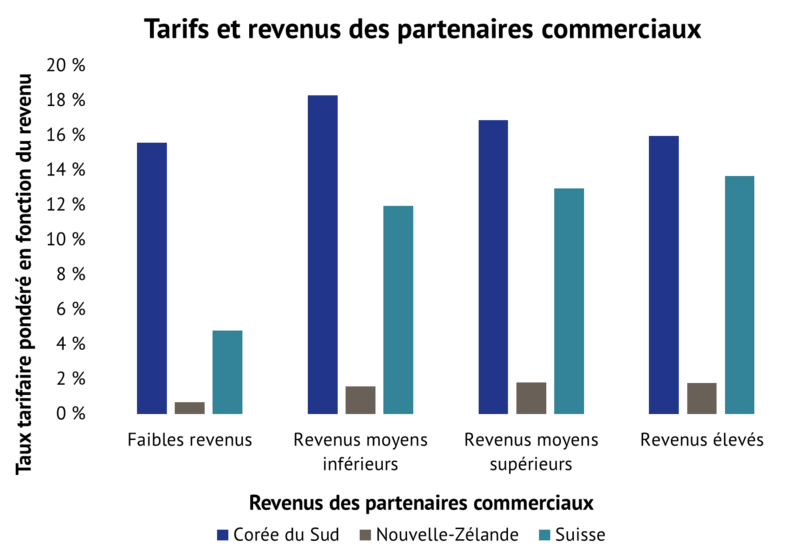 Finland ranks second and also makes significant contributions to peacekeeping and humanitarian interventions alongside low exports of arms to undemocratic lower-income countries. The United States contributes most to security in absolute terms and the largest proportion of GDP to international sea lanes protection. South Korea ranks last on security because of its limited contributions to international peacekeeping efforts and incomplete support for the international security regime. South Korea, Australia, Greece, Japan, and New Zealand were penalised for a lack of recent and detailed data on arms exports. Among CDI countries that published data, the Czech Republic exported the highest level of arms to poor and undemocratic countries. Labour mobility is potentially the most powerful tool for poverty reduction and income redistribution. By migrating to richer countries, workers increase their productivity through pairing their skills with capital, leading to higher incomes. They send billions of dollars home each year, a flow that surpasses foreign aid. The receiving country also benefits from migrants’ economic and social contributions. The CDI rewards countries for welcoming migrants and students from developing countries, accepting refugees and asylum seekers, embracing sound migrant integration policies, and joining international conventions protecting the rights of migrants. Sweden scores highest overall on the migration component, strengthened by its integration policies and acceptance of refugees and migrants from poorer countries. Germany, ranking second overall on migration, accepts most refugees, Austria has the most generous rate of accepting asylum seekers. Visit cgdev.org/cdi to explore the Commitment to Development Index, including full country reports, interactive web portal, full calculations, and method paper. The Center for Global Development (CGD) has compiled the Commitment to Development Index each year since 2003. The Center for Global Development works to reduce global poverty and improve lives through innovative economic research that drives better policy and practice by the world’s top decision makers. CGD Europe deputy director and senior policy fellow Ian Mitchell directs the Index, building on the work of CGD vice president Owen Barder, and of former senior fellow David Roodman. Anita Käppeli, CGD’s director of policy outreach for Europe, composes and leads the development of the CDI. The Index is supported by the CDI Consortium, which in 2018 included Australia, Denmark, Germany, Luxembourg, and Sweden. The content of this report does not reflect the official opinion of the Consortium members. Responsibility for the information and views expressed herein lies entirely with the authors. Pourquoi l’engagement pour le développement est-il important ? Compte tenu de l’intégration mondiale actuelle, les décisions des pays riches en matière de politique et leur comportement ont des répercussions sur les populations des pays à faibles revenus. De la même façon, une prospérité et une sécurité accrues dans les pays les plus pauvres profitent au monde entier. Ces conditions créent de nouvelles opportunités économiques, stimulent l’innovation, contribuent à la réduction des risques sanitaires et sécuritaires ainsi que les crises économiques. L’Indice de l’engagement pour le développement (CDI) met en avant les pays à revenus élevés dont les politiques ne visent pas seulement leurs propres intérêts, mais aussi le développement des autres et l’intérêt général. Comment l’Indice de l’engagement pour le développement est-il calculé ? Nous utilisons des milliers de données provenant d’une centaine d’indicateurs pour établir les classements globaux et pour chaque composante de la politique. Les pays enregistrent de bons résultats dans les domaines d’une aide au développement généreuse et de bonne qualité, de la transparence financière, de faibles barrières commerciales favorisant les échanges avec les pays en développement et de politiques migratoires ouvertes et encourageant l’intégration. Ils affichent aussi de bonnes performances pour les politiques qui améliorent les biens publics mondiaux ; par exemple, un soutien solide à la recherche et au développement technologique, la protection de l’environnement et les contributions à la sécurité mondiale par le soutien aux missions en faveur de la paix, et la prévention de la vente d’armes aux pays pauvres et non démocratiques. À l’instar des objectifs de développement durable (ODD), le CDI reconnait que les avancées en matière de développement sont globales. Cependant, alors que les ODD se concentrent sur les résultats et sur tous les pays, le CDI met l’accent sur la façon dont les politiques des pays les plus riches peuvent faire une énorme différence. Quels sont les résultats des pays évalués par le CDI 2018 ? La Suède est en tête du CDI de cette année, suivie par le Danemark. L’Allemagne partage la troisième place avec la Finlande. La Suède obtient une bonne note pour six des sept composantes du CDI, en se classant première dans le domaine de la migration, deuxième pour l’environnement et troisième pour l’aide. Il existe cependant une marge de progression en matière de sécurité, compte tenu de ses importantes exportations d’armes et de ses faibles contributions aux opérations internationales de maintien de la paix et de protection des voies maritimes. Le Danemark se classe cette année au deuxième rang, en tête de liste pour la sécurité et avec la deuxième meilleure note en matière d’aide. La Finlande et l’Allemagne partagent la troisième place. La Finlande obtient régulièrement de bons résultats dans presque toutes les composantes. L’Allemagne obtient des résultats particulièrement satisfaisants en matière de migration et de commerce, avec la logistique commerciale la plus efficace et les restrictions commerciales sur les services les moins importantes. L’Allemagne pourrait cependant améliorer la qualité de son aide et ses contributions à la sécurité internationale. Les pays européens montrent la voie. Les pays européens occupent les 12 premières positions de l’Indice, soulignant le leadership européen sur les questions de développement. La France arrive cette année au septième rang, avec de bonnes performances dans toutes les composantes. Elle est l’un des rares pays à avoir augmenté ses dépenses d’aide de 0,05 % pour atteindre 0,43 % de son revenu national brut (RNB). Le Royaume-Uni, en huitième position, est le troisième pays du G7 à se classer dans les 10 premières places, avec une note particulièrement satisfaisante dans les domaines du commerce et de la sécurité. Le Royaume-Uni est l’un des rares pays à respecter l’engagement international de dépenser 0,7 % de son RNB dans l’aide au développement à l’étranger, mais se classe dans le bas du tableau dans les domaines de la technologie et de la migration. Les Pays-Bas et le Luxembourg se partagent la cinquième place et la Belgique se classe dixième. Les trois pays ont mis en place des politiques intelligentes : le Luxembourg est en tête de la composante aide, les Pays-Bas de la composante commerce et la Belgique de la composante finance. Le Portugal, en neuvième position, démontre que l’engagement en faveur du développement n’est pas réservé aux plus riches. Malgré leurs contributions à la sécurité mondiale, les États-Unis occupent le 23e rang sur 27. Comme l’année dernière, les États-Unis obtiennent des résultats proches du bas du tableau, avec des résultats médiocres en matière de finance, d’aide et d’environnement, avec des émissions de gaz à effet de serre élevées, une production importante de combustibles fossiles et les taxes sur l’essence les plus faibles. Sa meilleure performance se situe dans la composante sécurité en tant que principal contributeur à la protection des voies maritimes mondiales et en tant que soutien majeur au maintien de la paix internationale. Sa note pour la composante sécurité est cependant réduite en raison de l’absence de ratification de la plupart des accords internationaux, notamment des traités sur le commerce des armes et l’interdiction des essais nucléaires. Nos données commerciales sont antérieures aux récentes politiques commerciales protectionnistes mises en œuvre par le gouvernement américain, ce qui se traduit par l’obtention par les États-Unis d’une note supérieure à la moyenne en matière de commerce, avec de faibles subventions agricoles et des tarifs douaniers moyens. Le retrait annoncé des États-Unis de l’Accord de Paris n’entrera en vigueur qu’en 2020, mais abaissera encore davantage la note de ce pays. La Pologne, la Grèce et la Corée du Sud occupent les derniers rangs. Même les pays en bas de classement fournissent des leçons aux autres en matière de soutien au développement. La Corée du Sud se classe en dernière position du CDI. Ses performances en matière de commerce, d’environnement et de sécurité sont les plus faibles du CDI. Cependant, avec son soutien extraordinaire à l’innovation, à la recherche et au développement, elle maintient sa position en tête de la composante technologique. La Grèce arrive en avant-dernière position avec des performances inférieures à la moyenne dans la plupart des composantes, mais elle est en tête pour ce qui est des faibles taxes sur l’essence et est récompensée pour son ouverture aux demandeurs d’asile. La Pologne, en 25e position, est à la traîne en matière de technologie, de migration et d’aide, mais elle est à la pointe de la protection de la biodiversité. Les Pays-Bas, l’Allemagne et l’Australie sont les leaders du commerce et les tarifs douaniers de la plupart de ces pays sont plus bas à l’égard des pays plus pauvres..
Les données du CDI pour 2018 sont antérieures au dernier cycle de tarifs douaniers mis en œuvre par les États-Unis. Les Pays-Bas, l’Allemagne et l’Australie sont respectivement les trois meilleurs pour le commerce. Les Pays-Bas ont des tarifs douaniers peu élevés, une bonne logistique commerciale (comme les infrastructures et les procédures douanières) et un commerce ouvert des services. En outre, ses subventions agricoles sont moins élevées que celles de l’Allemagne. L’Australie a des tarifs douaniers peu élevés, un commerce ouvert des services et de faibles subventions agricoles, mais une logistique commerciale relativement médiocre. Cette année, le CDI a adopté une nouvelle approche de mesure des tarifs douaniers, qui accorde une pondération supérieure aux tarifs pratiqués à l’égard des pays à faibles revenus. Sur cette base, les niveaux des tarifs douaniers ont été relativement stables au cours de la dernière décennie et les tarifs des pays du CDI ont tendance à être progressifs, c’est-à-dire plus faibles lorsqu’ils échangent avec leurs partenaires commerciaux les plus pauvres et plus élevés lorsqu’ils échangent avec les plus riches. Le tableau ci-dessus classe chacun des pays du CDI dans les sept domaines politiques. L’aide étrangère reste une source importante de financement pour certains des pays les plus pauvres, de sorte que le CDI récompense les pays qui accordent plus d’aide que leurs pairs en termes de part de leur RNB. Le CDI mesure la qualité de l’aide au moyen de l’évaluation révisée de la qualité de l’aide publique au développement (QuODA), qui utilise 24 indicateurs reflétant les principes reconnus de l’efficacité de l’aide pour maximiser l’impact, encourager les institutions, réduire la charge et promouvoir la transparence. Le note de la qualité de l’aide d’un pays est la combinaison de son score QuODA bilatéral et des notes QuODA obtenues par les organismes multilatéraux auxquels il verse l’aide. Bien que peu de pays soient forts à la fois en termes de quantité et de qualité de l’aide, le Luxembourg se classe en tête de cette composante, en donnant 1 % de son RNB et en obtenant de bons résultats sur la qualité de son aide bilatérale. La Suède enregistre également de bons résultats, tandis que la Hongrie est le pays qui a le moins donné (0,11 % de son RNB). Les États-Unis sont le pays ayant la plus grande marge d’amélioration. Malgré le fait que le pays est le plus grand donateur en termes absolus, il n’a fourni que 0,18 % de son RNB en aide, et bien qu’il verse de l’aide à des organismes multilatéraux efficaces, l’aide bilatérale des États-Unis obtient de piètres résultats. La Nouvelle-Zélande se classe globalement au premier rang de la qualité de l’aide, avec une aide bilatérale extrêmement efficace. La Corée du Sud, le Japon et le Canada versent leur aide aux institutions multilatérales les plus efficaces. Les nombres entre parenthèses indiquent le rang du pays dans la composante aide. Les investissements directs étrangers sont la principale source de financement pour de nombreux pays en développement. Le CDI récompense les pays riches dont les politiques soutiennent les investissements et ceux qui signent des engagements internationaux (notamment de prévention de la corruption et de protection des droits de l’Homme), le tout sans nuire à la capacité des pays partenaires à développer des politiques publiques durables. Les politiques permettant l’opacité financière, en revanche, permettent l’évasion fiscale, le blanchiment de capitaux et la corruption, la dégradation de la gouvernance et de la sécurité internationale ; celles-ci sont évaluées à l’aide d’indicateurs sélectionnés de l’Indice de l’opacité financière. La Belgique occupe la première place dans le domaine de la finance grâce à ses engagements internationaux en matière d’investissements et de transparence dans le secteur financier ; l’Italie et la France occupent les deux places suivantes. Le Royaume-Uni se situe au-dessus de la moyenne, mais améliorerait significativement sa note si ses territoires d’outre-mer et les dépendances de la Couronne s’alignaient sur le reste du pays. L’Espagne est la juridiction financière la plus transparente, suivie de l’Italie et de l’Irlande. La médecine, les énergies renouvelables, les technologies de l’information et de la communication et les autres avancées technologiques améliorent la vie de tous. Les technologies inventées dans les pays riches, comme les vaccins, les téléphones portables et les céréales à haut rendement, ont amélioré et sauvé de nombreuses vies. Cependant, les économies avancées peuvent aussi entraver la diffusion du savoir et de la technologie avec des protections restrictives des droits de propriété intellectuelle. Le CDI pénalise les pays pour les politiques qui peuvent entraver le flux international d’innovations, mais récompense le soutien des gouvernements à la recherche et au développement (R&D). La Corée du Sud, la Norvège et le Portugal affichent les meilleures performances pour la composante technologie. Ces trois pays se sont engagés à des niveaux élevés de gouvernement et ont mis en place des incitations pour les dépenses des entreprises en R&D. L’environnement politique de la Corée du Sud soutient les dépenses des entreprises en R&D, qui représentent plus de 3 % du PIB du pays, tandis que le soutien direct du gouvernement à la R&D atteint 1,5 % de son PIB. La Pologne se classe en dernière position, dépensant moins de 0,2 % de son PIB au soutien gouvernemental de la R&D. La Nouvelle-Zélande possède la législation relative aux droits de propriété intellectuelle la plus favorable au développement, suivie par le Canada. La Grèce obtient des résultats médiocres en ce qui concerne la sous-composante des droits de propriété intellectuelle (DPI), avec des possibilités d’amélioration, en particulier en matière de dispositions sur les pertes de droits. Les pays riches sont les principaux responsables du changement climatique, mais ce sont les pays pauvres qui en souffriront le plus. Ils sont plus exposés géographiquement, ont moins de ressources et de capacités au niveau de l’État pour faire face aux effets et une proportion beaucoup plus importante de leur population dépend de l’environnement pour satisfaire ses besoins journaliers. Le CDI récompense les pays qui réduisent leurs émissions de gaz à effet de serre, mettent en place des taxes élevées sur les carburants, ne subventionnent pas le secteur de la pêche, réduisent les importations des bois récoltés illégalement et s’engagent dans des conventions internationales majeures. Ces mesures profitent à tous les pays. La République slovaque est en tête du CDI en matière de politiques environnementales, avec des taxes sur l’essence et des réductions des émissions de gaz à effet de serre parmi les meilleures. La Suède a obtenu les meilleurs résultats globaux en matière de contrôle du changement climatique, mais des subventions élevées à la pêche l’ont empêchée d’occuper la première place. La Pologne occupe la troisième place, en partie à cause de ses faibles subventions à la pêche et de ses taxes élevées sur l’essence. La Corée du Sud prend la dernière place avec un engagement limité pour la biodiversité, des importations élevées de bois tropicaux et une forte consommation d’hydrochlorofluorocarbures. Le Japon et l’Australie importent également d’importantes quantités de bois tropicaux et se situent au bas du tableau de la composante environnement. Le graphique ci-dessous s’appuie sur deux des indicateurs du CDI sur les émissions de gaz à effet de serre et compare les émissions actuelles et les réductions passées.. La Suède a fait de grands progrès dans la réduction des émissions, tandis que la Norvège a des émissions faibles, mais largement inchangées. À l’inverse, l’Irlande et le Luxembourg ont considérablement réduit leurs émissions, mais elles restent relativement élevées par rapport aux autres pays. Le commerce procure aux pays pauvres des possibilités d’attirer des investissements, de créer des emplois et de réduire la pauvreté. Les pays riches contrôlant les marchés les plus importants, certains biens et services en provenance de pays pauvres restent confrontés à des barrières commerciales. Les tarifs douaniers élevés, les subventions qui créent des conditions de concurrence inégales pour les produits agricoles, et les lourdeurs administratives et les contraintes juridiques rendent les échanges commerciaux plus difficiles pour les pays en développement. Le CDI récompense les pays riches les plus ouverts aux biens provenant des pays en développement, avec des tarifs douaniers peu élevés, peu de subventions agricoles et des processus d’importation simplifiés. Ces politiques profitent aux consommateurs et aux contribuables de tous les pays. Les Pays-Bas obtiennent les meilleurs résultats en matière de commerce grâce à de faibles subventions agricoles, à une solide logistique commerciale et à une ouverture au commerce des services. En tant que membre de l’Union douanière de l’UE, les Pays-Bas ont également des tarifs relativement bas. L’Allemagne et l’Australie se classent respectivement deuxième et troisième. La Suisse, la Norvège et la Corée du Sud sont au bas du classement de la composante commerce. Ces pays ont les tarifs douaniers les plus élevés, ce qui limite l’accès de leurs marchés aux producteurs des pays en développement. Pour le CDI 2018, nous pondérons les tarifs douaniers en fonction des revenus des partenaires commerciaux pour la première fois, les tarifs à l’égard des pays les plus pauvres étant pondérés à un et ceux à l’égard des pays les plus riches s’approchant de zéro. Le graphique ci-dessous s’appuie sur ces données. La Corée du Sud a des tarifs douaniers élevés qui avaient tendance à être plus faibles à l’égard des partenaires commerciaux plus riches qu’à l’égard des partenaires à revenu intermédiaire. Les tarifs douaniers suisses étaient très élevés, mais ils étaient les plus progressifs de tous les pays du CDI ; ils avaient tendance à augmenter avec les revenus des partenaires commerciaux. La Nouvelle-Zélande a obtenu la meilleure note pour cette composante avec des tarifs qui sont progressifs et également faibles en valeur absolue. La sécurité et le développement sont étroitement liés. La guerre et la violence politique peuvent détruire les moyens de subsistance et les institutions publiques, tandis que la pauvreté et la faiblesse des institutions favorisent l’éruption de la violence. Il est dans l’intérêt de tous les pays de soutenir la paix et la sécurité internationale. Le CDI récompense les pays qui contribuent aux opérations de maintien de la paix et aux interventions humanitaires, positionnent des flottes militaires pour sécuriser les voies maritimes et participent aux systèmes de sécurité internationaux encourageant la non-prolifération de l’armement, le désarmement et l’État de droit international. Le CDI pénalise les pays pour certaines exportations d’armes, en particulier à destination des régimes non démocratiques, et pour la non publication de données sur les exportations d’armes. Le Danemark figure en tête du classement sur la sécurité car il contribue fortement aux opérations de maintien de la paix et aux interventions humanitaires approuvées sur le plan international. La Finlande se classe deuxième et contribue également de manière importante au maintien de la paix et aux interventions humanitaires parallèlement à de faibles exportations d’armes vers des pays à faibles revenus non démocratiques. Les États-Unis sont le pays qui contribue le plus à la sécurité en termes absolus et qui affecte la plus grande partie de son PIB à la protection des voies maritimes internationales. La Corée du Sud se classe au dernier rang sur la sécurité à cause de l’insuffisance de ses contributions aux efforts internationaux de maintien de la paix et à la timidité de son soutien au régime de sécurité internationale. La Corée du Sud, l’Australie, la Grèce, le Japon et la Nouvelle-Zélande ont été pénalisés en raison de l’absence de données récentes et détaillées sur leurs exportations d’armes. Parmi les pays du CDI qui ont publié des données, la République tchèque est celui qui a exporté le plus d’armes vers des pays pauvres et non démocratiques. La mobilité de la main-d’œuvre peut être l’outil le plus puissant pour la réduction de la pauvreté et la redistribution des revenus. En migrant vers les pays plus riches, les travailleurs augmentent leur productivité en associant leurs compétences au capital, et obtiennent ainsi des revenus plus élevés. Ils envoient des milliards de dollars chaque année vers leur pays d’origine, un flux qui dépasse celui de l’aide internationale. Le pays d’accueil bénéficie également des contributions économiques et sociales des migrants. Le CDI récompense les pays qui accueillent les migrants et les étudiants des pays en voie de développement, acceptent les réfugiés et les demandeurs d’asile, adoptent des politiques judicieuses d’intégration des migrants et adhèrent aux conventions internationales visant à protéger les droits des migrants. La Suède obtient les notes les plus élevées dans l’ensemble pour la composante migration, renforcée par ses politiques d’intégration et l’acceptation des réfugiés et des migrants des pays plus pauvres. Bien que l’Allemagne, qui se classe en deuxième position sur la migration, accepte la plupart des réfugiés, l’Autriche a le taux d’accueil des demandeurs d’asile le plus généreux. Rendez-vous sur le site cgdev.org/cdi pour en savoir plus sur l’Indice de l’engagement pour le développement, y compris les rapports par pays, le portail Web interactif, les calculs complets et le document de méthode. 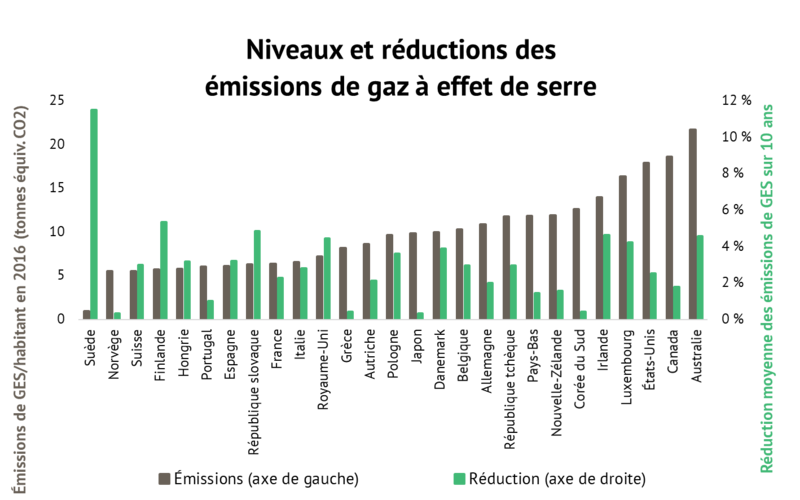 L’Indice de l’engagement pour le développement est compilé chaque année depuis 2003 par le Center for Global Development (CGD). Le Center for Global Development œuvre à réduire la pauvreté mondiale et à améliorer les vies par le biais de recherches économiques novatrices qui promeuvent de meilleures politiques et pratiques de la part des décideurs de premier plan. Ian Mitchell, maître de recherche sur la politique et directeur adjoint du CGD Europe dirige les activités de l’Indice, s’appuyant sur les travaux antérieurs d’Owen Barder, vice-président du CGD, et de David Roodman, ancien maître de recherche. Anita Käppeli, directrice de la communication politique du CGD pour l’Europe, rédige et dirige le développement du CDI. L’Indice est soutenu par le Consortium du CDI qui inclut en 2018 l’Australie, le Danemark, l’Allemagne, le Luxembourg et la Suède. Le contenu de ce rapport ne reflète pas les opinions officielles des membres du Consortium. Les auteurs de ce rapport prennent la responsabilité des informations et points de vue exprimés dans ce rapport. You may use and disseminate CGD’s publications under these conditions.